Located in County Meath, Ireland, is the tomb of Newgrange that dates back to 3200 BC, during the Neolithic Period in Ireland. 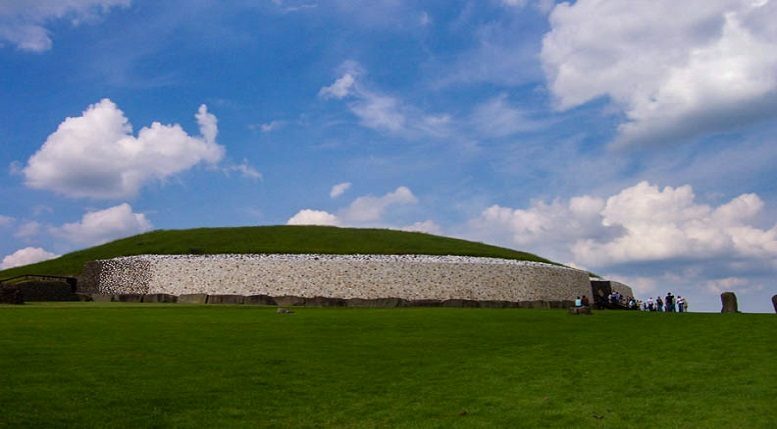 It is a section of a larger historic site known as Brú na Bóinne that contains three tombs Newgrange, Knowth, and Dowth with Knowth being the largest of the three. Newgrange is known as a passage tomb and was wonderfully constructed by the Neolithic people. As you approach this magical tomb, a large rock sits at an opening to a passage. This rock is beautifully carved with Celtic designs and is known to have the only triple spiral motif Celtic design ever found. Around the circumference of the Newgrange tomb are 97 large stones, known as kerbstones, with each one also having carvings of Celtic designs. The inner section of the large circle is a large mound of earth and leans against an angled wall composed of Quartz and Granite. The angle of the quartz wall is a remarkable piece of architecture & construction even by today’s standards and was build on top of the large ring of carved rock. As you walk around the site you can see the beautiful Celtic designs carved into the face of each rock, although very little is known about the Celtic designs it does allow us to interrupt our own meaning and to let our imagination run wild. We do know these Celtic designs were most likely to have been carved into the rocks later and is believed the carvings had been done by a man who had travelled from France or Italy and the Celts didn’t arrive in Ireland until later during the Iron Age Period. As you enter the passage of the height of the passage is at first small but gets higher as you enter the main chamber. Inside the main chamber, which is a cross shape, there are large rocks that form part of the walls of the passage. Beautiful Celtic designs can be found on the rocks along the walled passage and inside the main chamber with the roof towering to 19m in height. The main chamber served a main purpose as a tomb and when excavated the remains of five bodies had been found. Newgrange or the whole area of Brú na Bóinne must have had a major significance for the people who has first build the sites as the design and construction of the tombs were very complex, to say the least. The quartz & granite would have come from miles away from Newgrange as this type of stone is not found in the area. The large rocks and standing stones would have also been transported (somehow) from miles away as again, these type of rocks are not generally found in the area where the site is located. It was not until the 17th Century until Newgrange was discovered and was later excavated in 1962 & 1975. The most magical part of Newgrange is how it is aligned perfectly with the sun during the winter solstice. The sun shines through a roofbox, located above the passage entrance, and rises to light up the main chamber tomb lasting over 15 minutes. Each year people in Ireland gather at the site of Newgrange to experience this amazing event but only those who hold special invite are allowed to be within the tomb as it happens.